After 3 weeks of part self, part snow-induced exile, I returned to the seaside last night during an icy gale that would’ve had an Inuit running for his furs. I expected to be welcomed by a few mushy looking plants, but immediately I stepped through the gate there was a disgusting squelch, followed quickly by another. In the pitch dark I wondered if I’d trodden in a lump of displaced moss, remnants of the snow, or worse still a dead animal. I was wrong on all counts. The morning light revealed several fallen fruit from one of our climbers, the rampant Holboellia latifolia, a native of the Himalayas. 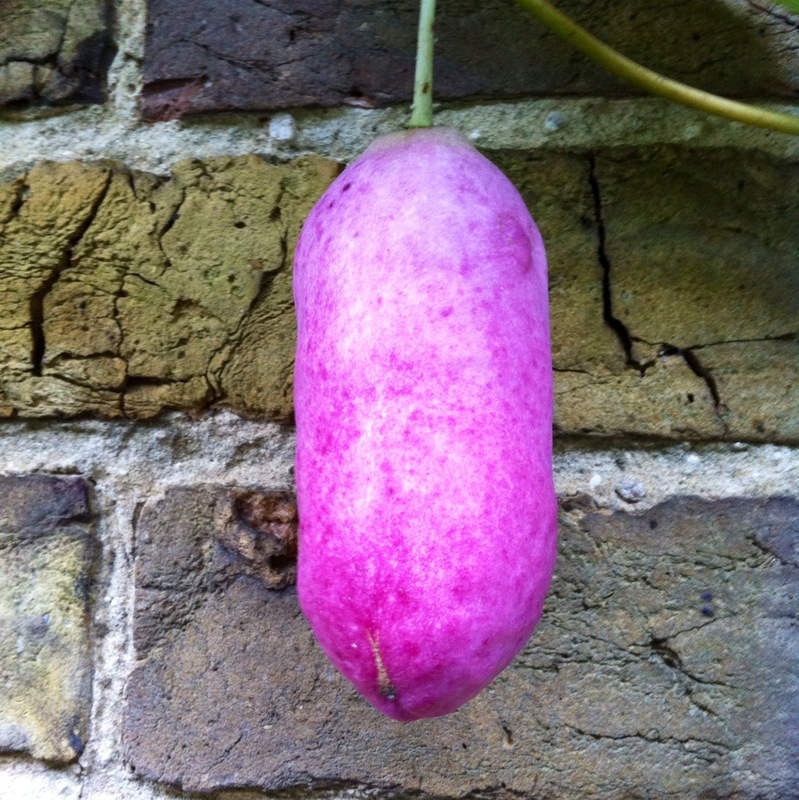 It was early January before I even noticed these bloated, sausage-like fruits, the colour of uncomfortably inflamed skin. Beautiful they are not, but quite a surprise when you’ve not seen them before. Apparently they are edible, but ignorant of their harvesting time they are now good for nothing other than composting. I read also that it takes a very warm summer to encourage fruiting, so clearly our specimen is deluded or popped over to the Canaries for a break whilst I wasn’t looking. Holboellia latifolia is a fantastic evergreen climber if you want to cover a wall or pergola quickly. It’s reasonably hardy and can be trimmed liberally throughout the growing season to keep it in check, though this is a task which needs doing regularly unless you have a very large space to cover. The leaves of young plants start with three leaflets, but mature ones will mostly be made up of five. 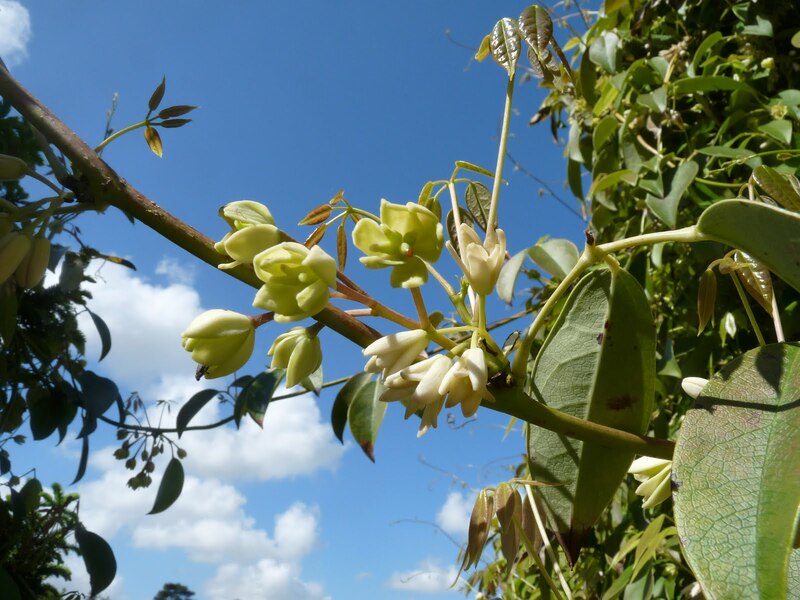 What makes Holboellia especially desirable is the insignificant but deliciously scented flowers which appear in early spring and last for many weeks. The greenish male flowers and the pink female flowers appear in clusters along the twining stems. They fill the garden with a scent of gardenias, especially strong during warmer spells. All it requires in return is a bit of shelter from the worst gales, a moist soil and a feed with blood, fish and bone every spring. In truth we should have gone for something a little less ambitious in this spot, but doing battle with the flailing tendrils every so often is quite satisfying. Plus last year the blackbirds made their nest in the shelter of its branches, so I guess it’s here to stay. Any one have a recipe for Holboellia jam? Below, small pink female flowers and slightly larger male flowers, set against a bright spring sky.